Blurb on the can: Our Chocka Riwaka is crammed full of the tastiest bits of the South Island, from its namesake in the north to the very southern tip. We’ve only used Riwaka hops and a selection of malts, all sourced from ‘The Mainland’ to brew this hop-forward pale ale with citrus aromas, toffee malts and a smooth amber base. It’s as South Island as scarfies, cribs, and cheese rolls. 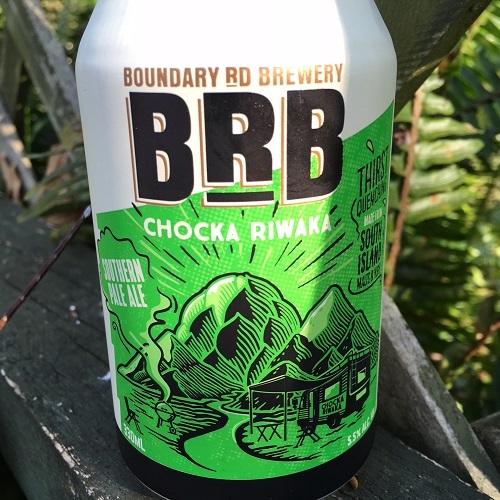 The review: I love the look of this beer – the funky Southern Alps/hop image, and the cool green-white-and-black colouring – and that’s about all that I love about Boundary Road’s ‘Chocka Riwaka’ Southern Pale, to be perfectly honest with you. That’s right. I do NOT like this beer. In fact, I think I even hate the weird tinge of the riwaka hops, or is it the malts that I don’t like? Either way, there’s just something off about this beer; a sickly-sweet, horrible, dirty, taint. I really don’t know if I can be more specific than that. Perhaps I’ve just got a bad batch? The verdict: After the dizzying heights of Boundary Road’s ‘Powder Hound’ XPA (I assure you that I’m honestly not being glib – I really did enjoy that beer quite a lot), I don’t think I could be more disappointed with ‘Chocka Riwaka’ Southern Pale Ale. I never want to drink this beer again. Ever. Life is just way too short to drink bad beer like this one. Beer/movie combination: I remember going to see Indiana Jones and the Kingdom of the Crystal Skull with very high hopes back in 2008. I was absolutely gutted, of course. That movie was pure garbage – just like this beer.